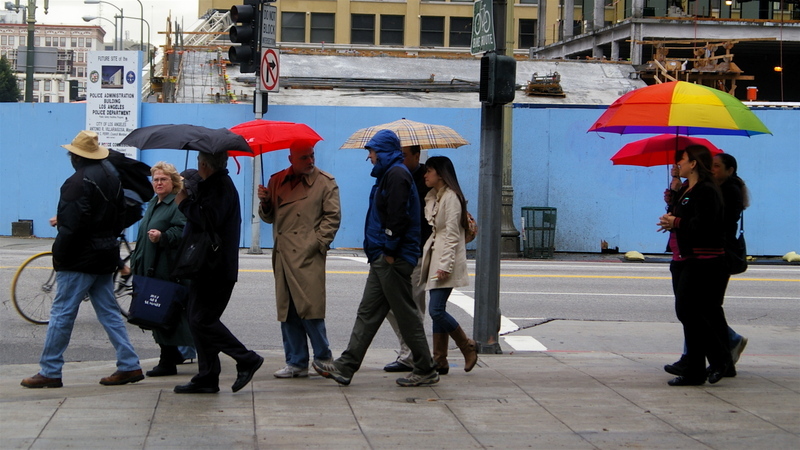 Assorted umbrellas were seen around Downtown, many must have been last-minute choices made by dwellers who see rain four times a year. You can spot umbrellas that were trade show giveaways. They have product names emblazoned across the top. Others were just wind bait, ready to be turned inside out by one good gust. I think that's a sun umbrella on the right. You can spot someone from a rain-soaked city. They will deftly close their umbrella outside a door, lightly tapping it twice, then have a last quick shake that slips off the rain, all in a careful motion. Others will stumble in, umbrella wide open, and wrestle with the handle, closing it only to get water all over themselves. "Rookie" I mumble as I dry off my shoes.